THE PICKIEST EATER IN THE WORLD: MA MAISON PART DEUX & THE BISTRO GROUP GC WINNER! 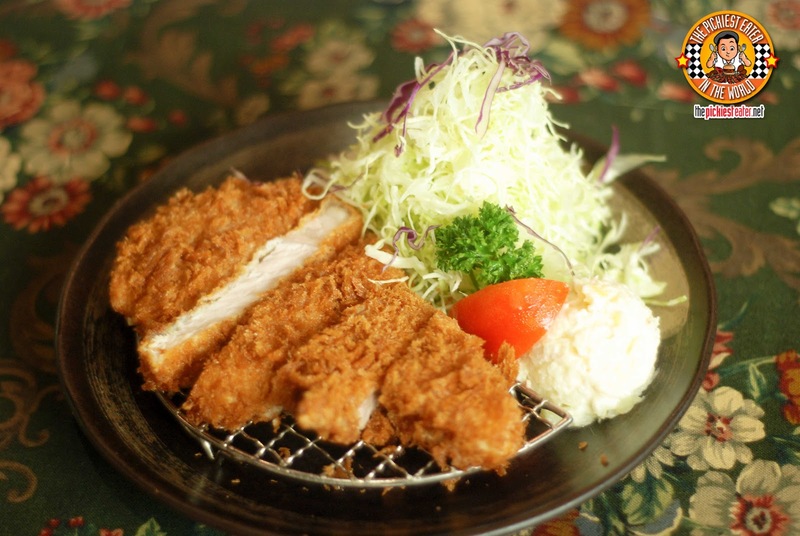 I had been to Ma Maison once before, and was more than satisfied with my order, the pork Tonkatsu. unfortunately, Rina was not with me, and I was forced to rely on my trusty Galaxy S2 camera for the pictures. Though it did a noble job, it really can't compare to the photos that Rina has taken in the past. 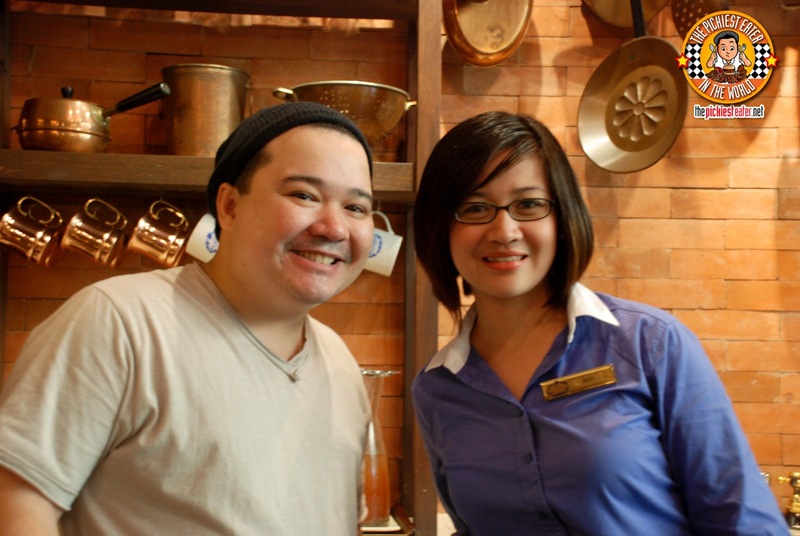 Funnily enough, When I started the Bistro Group give away, Rina saw the pictures from my Ma Maison entry and reminded me that i still hadn't taken her to try their famed Japanese Western fusion dishes like I had promised many moons ago. I told her that by the time the winner of the giveaway has been announced, she would have tasted their innovative meals. I didnt realize time would pass by so quickly! So if the giveaway ended on Saturday, this was our trip to Ma Maison on the following Monday. Oh and guess what? 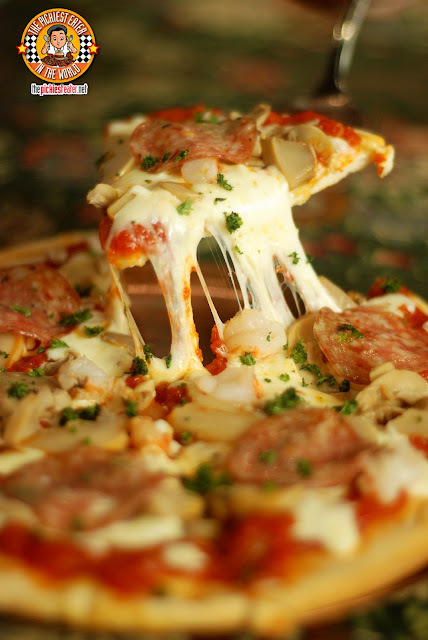 If you read on, you'll find out if YOU won the coveted P3,000 GC from THE BISTRO GROUP! It may have been my second time to go to Ma Maison, but I was just as impressed with the interiors as I was the first time I walked through their doors. 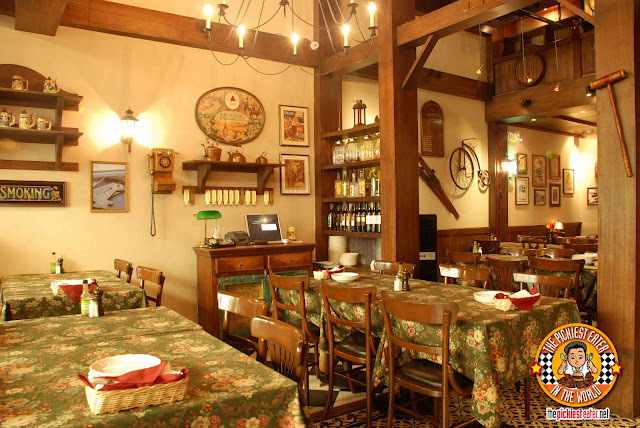 Rina fell in love with the rustic, yet dainty feel of the place, with the most intriguing antiques adorning the walls. Rina now has a new favorite drink.. Ma Maison's Aloe Vera Apple (P125). 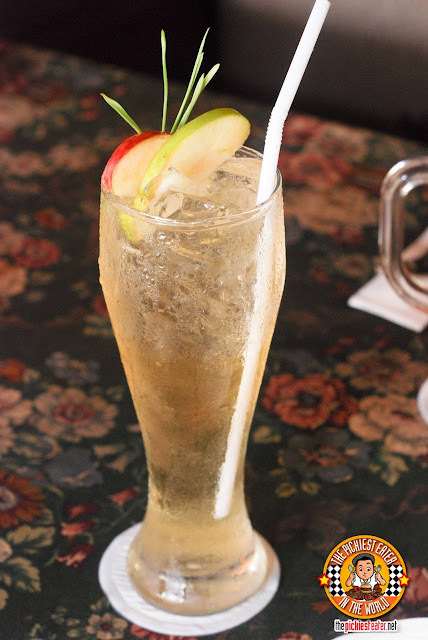 It's a refreshing apple flavored drink, where the bits of aloe vera hits the back of your throat as you continue to sip. Rina was only halfway done with her first glass when she declared that she's going to be ordering another one. 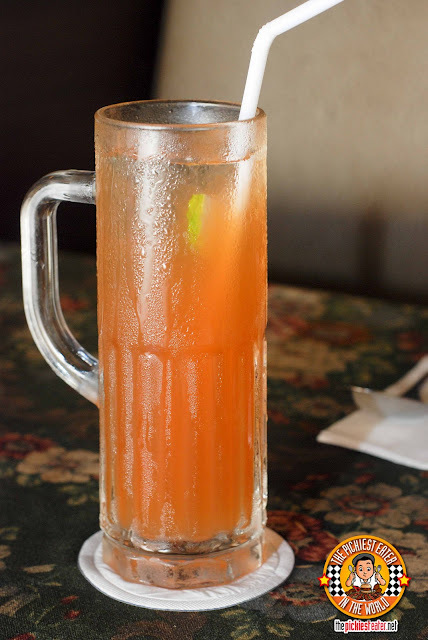 Since I was looking for something refillable, I had their Iced Lemon Tea, which was also quite the thirst quencher. The right blend of brewed tea and lemon made this drink not overly sweet, and a nice companion to our meal. I'm gonna eschew all the comedy right now and flat out just say it. 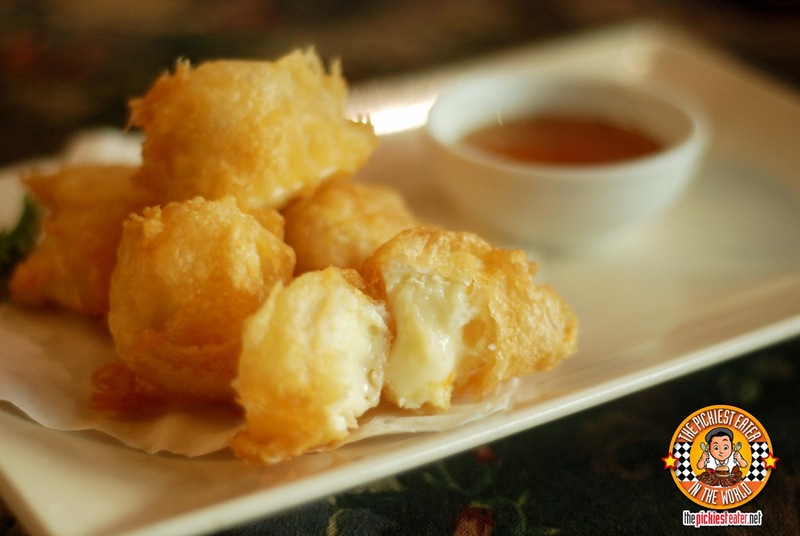 The Camembert Cheese Fritters (P385) are one of the best things I've ever put inside of my mouth. You've seen me eat a LOT of amazing things in the past, and this ranks way up there. The "fritters" are slices of Camembert cheese dipped into a beer batter and deep fried, then served with a side of honey vinaigrette. The coating becomes a crispy golden coating, and when you bite into it, the immaculately soft cheese gentles oozes out. The Honey Vinaigrette creates a beautiful balance of sweet with a hint of acid, and melds perfectly with your fritter. Rina's exact words were, "Uh-oh. THIS is what i'm going to be dreaming of tonight!". Any other husband might have been offended, but I understood exactly where she was coming from. 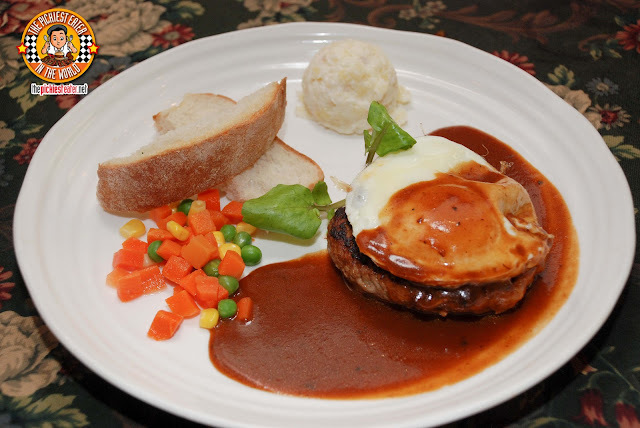 A meal of mine from A Bistro Group Restaurant would not be complete without a Burger.. and the closest thing they had was a Burger Steak. My waitress, Rachel, asked me what sauce I would prefer with the Burger Steak, with my choices being the "Brown Sauce", or their "Wafu Sauce". Being clueless to what either one was, I asked her what she would suggest. Rachel beamed with pride when she confidently suggested the brown sauce, explaining how this sauce was stewed for hours in different herbs and spices, and is the signature sauce of Ma Maison. After an intro like that, I didn't even bother asking what the hell "Wafu" was. I said just said, "Bring on the Brown Sauce!". I also asked Rachel to please make sure that the egg yolk was still wet (I have a strong dislike for hard yolk), and thankfully it was done perfectly. Slicing the egg right through, caused the yolk to spread around the patty, giving the meat a delicate creaminess. As expected burger patty itself was thick, meaty and delicious. But as Rachel predicted, it was the Brown sauce that brought the dish to the next level. Long after the burger patty was gone, I was using the slices of sour dough bread to sop up all the leftover brown sauce from the plate. I don't know about you, but one of my favorite components of a Donburi (with my fave being Katsudon) is the egg mixed with onions in the lightly sweet soy sauce. 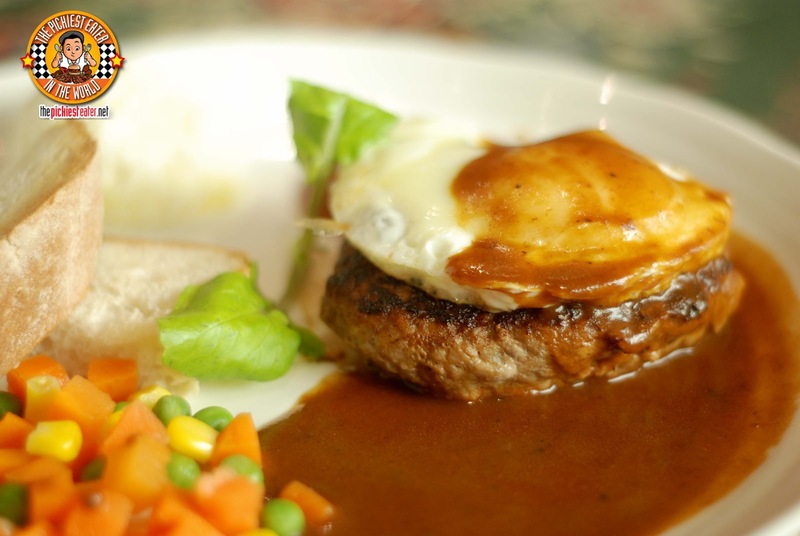 Now, close your eyes and imagine that egg and onion mixture with the sauce. Next, add a little bit of mushrooms.. both button and Shimeji. Then.. What the hell, throw in some bacon while you're at it! Finally, take scrambled egg mixture, and place it on top of a bed of al dente pasta. The result? 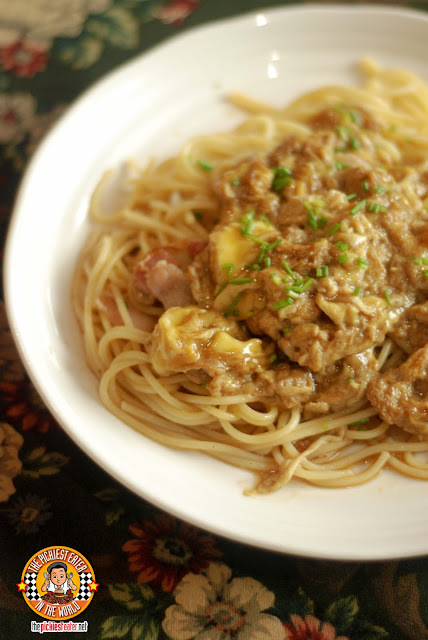 Ma Maison's Japanese Style Spaghetti (P295). Rina and I really enjoyed this.. The egg soaked up the sauce and brought in a touch of sweetness and a nice saltiness that went well with the bacon and pasta. I'm always looking out for non-tomato based pasta dishes, and I was quite surprised to find a delicious one here! 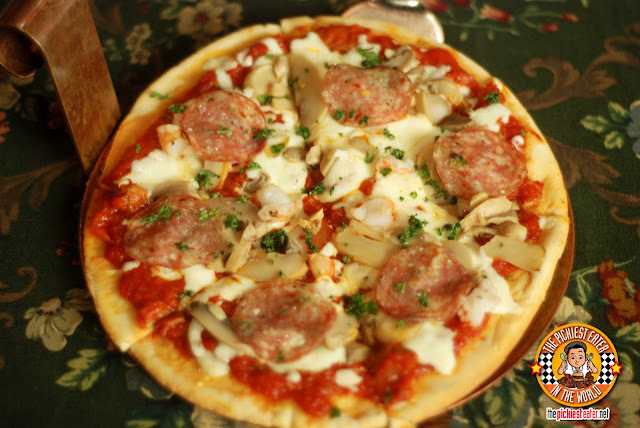 I was curious about the pizzas of Ma Maison, and how it fit in to the"Fusion" Theme of their menu. Rachel told me that their "Chef's Pizza" was their best seller, so I decided to go with that. When they placed it in front of me, I was a tad bit concerned because it looked a lot more "tomato-ey" than it did in the picture on the menu. Rina said, "Well what did you expect? Your ordered a pizza". Duh. The Chef's Pizza (P245) had a nice medley of flavors brought on by the tomato sauce, the salami, mushrooms, prawns, and Bacon (Yes, I ordered two items with bacon). The tomato sauce, though it really was a bit thick, wasn't that strong in acid content as I had originally feared. It was, in fact, a bit sweet. Being the self-sacrificing husband that I am, I removed the prawn bits from my pizza, and gave it to my shrimp loving wife. This is a good pizza no doubt, but not one that really stands out. 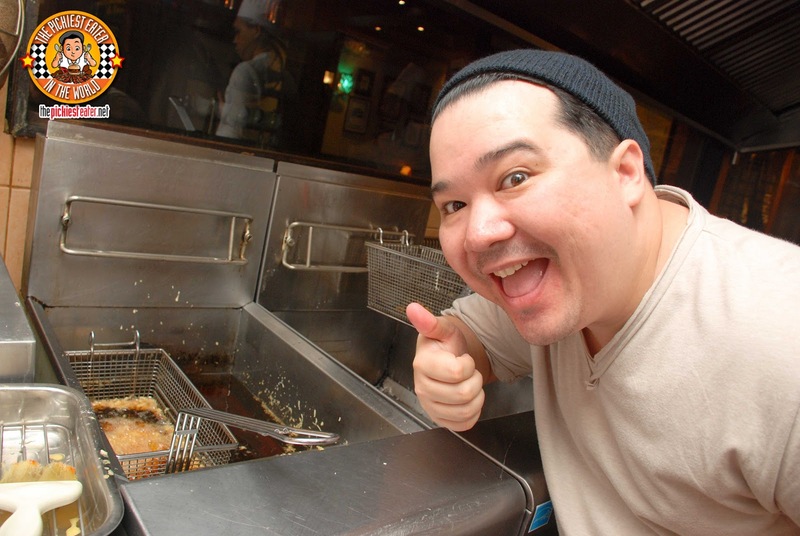 I was fortunate enough to get the booth with a window to the kitchen, which gave me a clear view to the fryer. I asked Sid, Ma Maison's Restaurant Manager if it was ok if I took pictures of how they prepared Rina's Tonkatsu through the window, as to not be obtrusive to the entire process. She said it was fine, and upped the ante a little bit. She actually let me into the kitchen. I don't know if this is actually allowed, but I wasn't going to be the moron that says no to that! 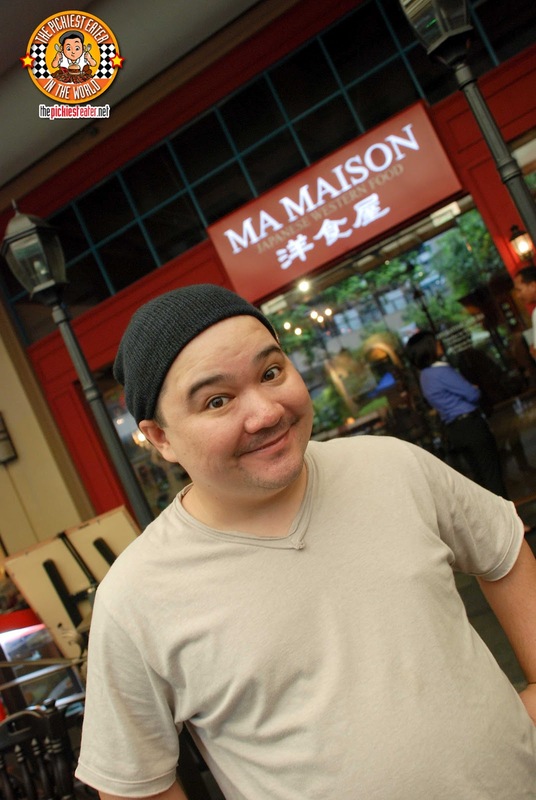 Sid introduced me to Ma Maison's Chef Mark, who was more than happy to show me the process on how Ma Maison makes their Tonkatsu. First off, Chef Mark pounds the pork loin cutlet as if it just insulted his mother. He then adds a bit of salt and pepper (and maybe a bit of other spices that he's not allowed to tell me). He then dredges the pork loin into a bit of flour, lightly caking all around. 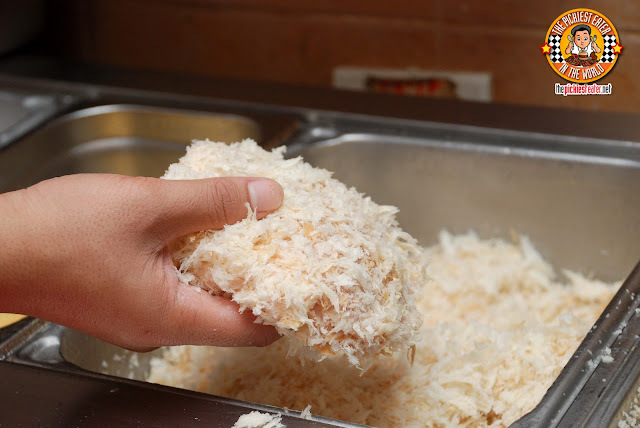 He then bathes the cutlet into an egg wash..
Before burying it in Nama Panko -Fresh Japanese Bread Crumbs-, covering the entire cutlet, making sure that not a single spot is missed out. Then pulled out after four minutes! The result? 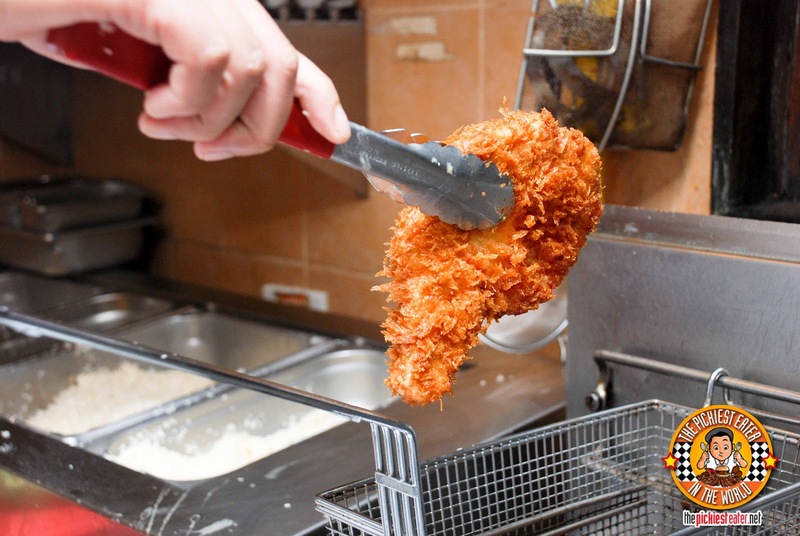 A stunning, perfectly deep fried piece of Tonkatsu! Being the heavyweights in the Tonkatsu world, its inevitable that Ma Maison and Yabu: The House Of Katsu draw comparisons. Both are amazing, no doubt, with Ma Maison's cutlet closer to the fattier "Rosu" of Yabu. Both cutlets are prepared the traditional way, with the biggest difference being in the sauce. 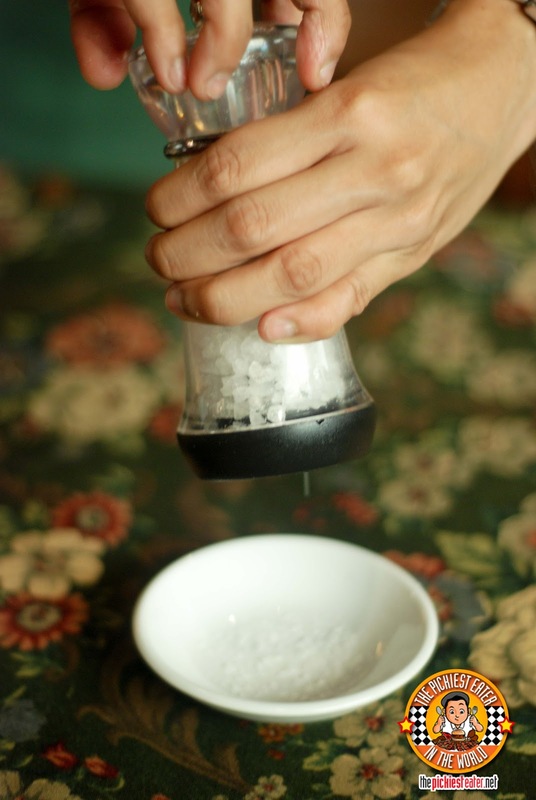 Both use Japanese sea salt, which isn't as strong as your average ordinary salt. 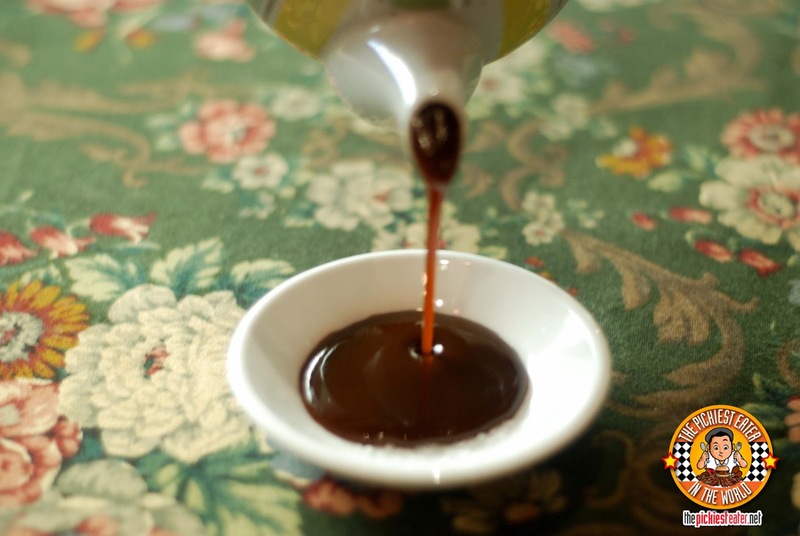 Naturally, Chef Mark didn't go into details, but instead of the traditional Tonkatsu sauce, Ma Maison uses a special "Wafu" sauce for their Western Fusion version. It has the tanginess of the tonkatsu sauce, but perhaps just a bit sweeter. Rina's description was that it seemed like a Japanese BBQ Sauce. Rina and I were quite stuffed, but once we saw the White Chocolate Mixed Fruit Tart (P195) in the menu, our internal organs scooched on over to one side and managed to make room for dessert. 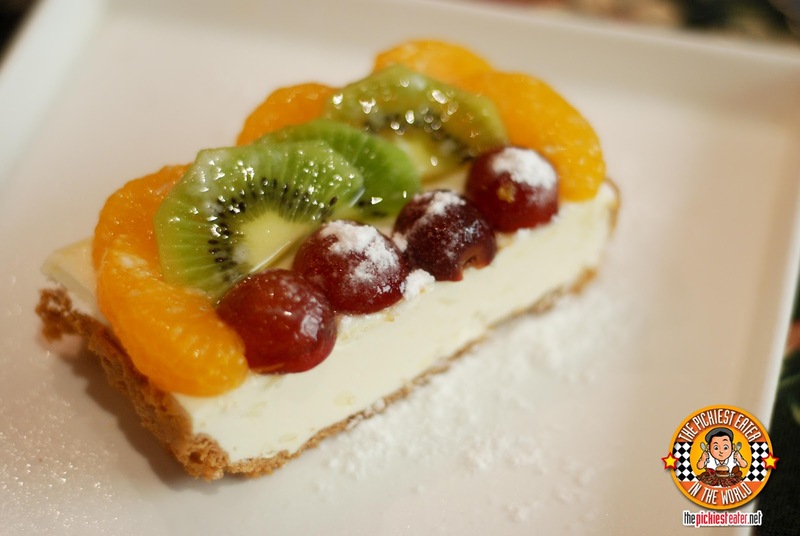 It had a nice buttery crust, and the white chocolate itself was so creamy and had a subtle sweetness, that was the perfect compliment to the freshness of the fruits..Grapes, Mandarin Oranges, and Kiwi. 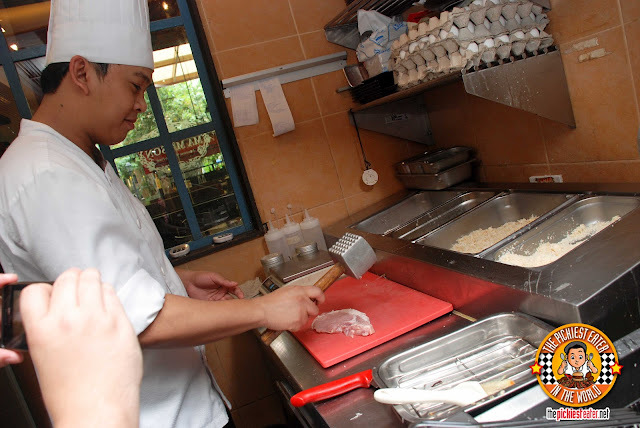 I know having an open kitchen really keeps you on your toes, but kudos to the kitchen staff of Ma Maison, because their workplace was absolutely spotless! 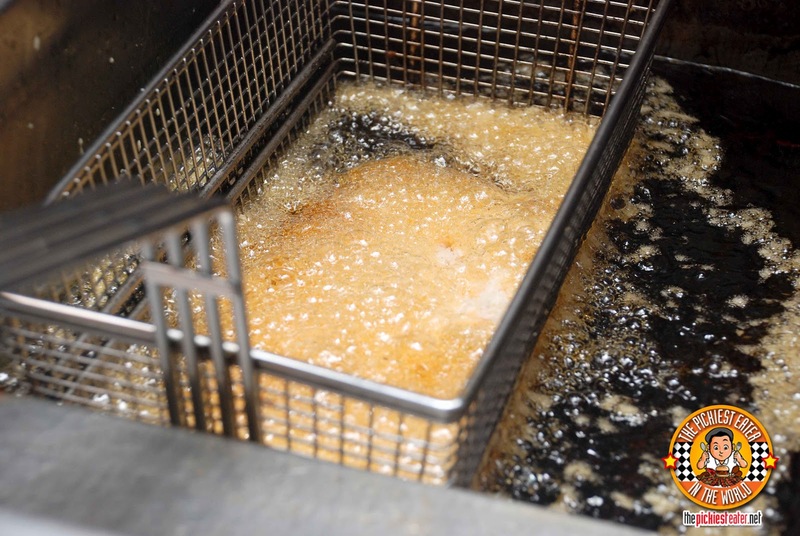 Any drop of egg yolk, or soy sauce onto the stainless steel surfaces gets wiped up by someone within seconds! Great way to set standards in the kitchen! 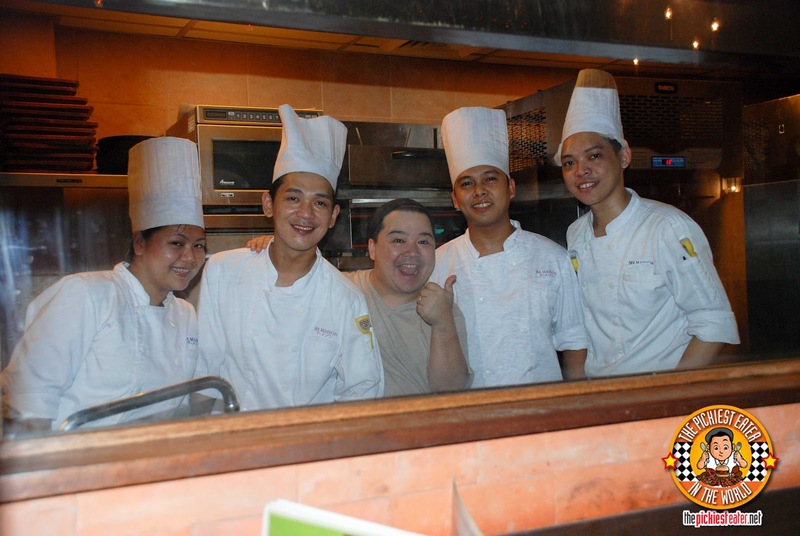 Chef Mark and the Ma Maison Kitchen All Stars! I was hoping one of them would break out into song or something. Where's Karylle when you need her?? and servers Rachel, Ronel, and Maris were an absolute delight! Well what do you expect.. It's a Bistro Group Restaurant! Price-wise, I find it to be on the higher side, however nothing to exorbitant. You clearly get value for your money. I would absolutely, positively have no hesitations going back to Ma Maison.. Especially for the Camembert Cheese Fritters!! And fear not, my friends.. The Merry Moo Giveaway is still ongoing..
And brace yourself for giveaway #8, happening VERY soon! oh yummmy! congrats to the winner!